A transmission electron micrograph of a Golgi apparatus, a membranous subcellular structure. Membrane proteins can be integral (I) or peripheral (P), determined by their amino acid structure. Peripheral proteins bind to integral proteins and to cytoskeletal proteins (L). millions of copies per cell. Built into the structure of each of these proteins is molecular information directing the way it sits in its membrane and an address tag targeting it to its home. 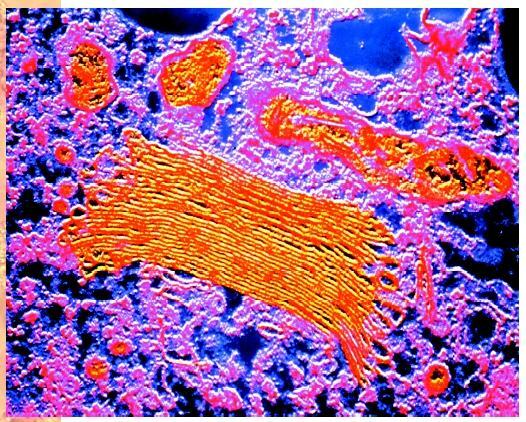 Membranes do not simply serve as walls between cellular compartments but are also participants in their metabolism . Many membrane proteins are transporters, moving solutes between the aqueous compartments. Other membrane proteins serve as enzymes that catalyze vital processes; for example, the harvest of energy from food. A variety of membrane proteins are receptors, signal transducers that transmit stimuli received outside the cell (for example, hormone or odor molecules) to functional proteins inside. The signals conveyed to the cytoplasm typically turn on complex circuits of response, adapting the metabolism of the cell to a perception of the outside world. Thus, receptors transport information rather than cargo across membranes. There are two general ways this transfer of information occurs. First, in many cases, the binding of the external stimulus molecule to the receptor brings about a specific change in the shape of this protein. The altered form of the receptor is then recognized by a relay protein inside the cell because its new shape precisely matches a site on the relay protein, enabling them to fit together like a key in a lock. This association turns on the response. The second class of receptors uses a somewhat different strategy: the binding of extracellular signal molecules to these membrane molecules causes them to change shape, but, in this case, their altered contour allows them to associate with one another (once again, through lock-and-key recognition). These conglomerates are then recognized as a stimulus by the appropriate relay proteins at the cytoplasmic side of the membrane. Most cells have cytoskeletons : protein scaffolds that lend mechanical support to both the watery interior of the cell and to their fragile and deformable membranes. Membranes are bound to the underlying cytoskeleton through linker proteins. Cytoskeletal proteins can tap adenosine triphosphate ( ATP ) or some other high-energy molecule to push and pull on the membrane so as to change its contour. Amebae and white blood cells, for example, are made to crawl as their plasma membranes are deformed into pseudopods by a dense mass of filaments in the underlying cytoskeletal array. In addition, some membrane-spanning proteins link the cytoskeleton inside the cell to filaments in the extracellular space and thereby manage the intricate relationships of the cells in human tissues. Lipid bilayers are like oily liquid films. Their molecules diffuse about randomly within the membrane but avoid the aqueous environment, just as oil shuns water. This is because the chemical nature of lipids is mostly nonpolar, whereas that of water is polar . Some proteins destined for the membrane are designed so that groups of nonpolar amino acid side chains create a water-shunning (hydrophobic) region on their surface. This lodges the protein in the interior of the bilayer. Proteins that are anchored by dissolving in the bilayer core are said to be integral to the membrane. At the same time, the tops and/or bottoms of these integral membrane proteins make contact with the water space. Predictably, these exposed regions are covered with polar amino acid side chains, attracted to water, which help to orient and stabilize the protein in the membrane. Every copy of an integral membrane protein that spans the bilayer is oriented identically; for example, with the same end pointed inside or outside, as befits its function. Other membrane proteins are entirely covered with polar amino acid side chains. Although these proteins are water soluble, they nevertheless associate with membranes. This they do by making specific lock-and-key attachments to the projecting portions of integral proteins. These docked water-soluble molecules are called peripheral membrane proteins because they reside outside the lipid bilayer. Their anchorage can be permanent or they may get on and off the membrane, randomly in some cases or else in response to a biological signal. A third mode of membrane association is for the cell to attach hydrophobic tails to peripheral proteins. The tails then dissolve in the hydrophobic (nonpolar) core of the bilayer, thereby anchoring the protein. Typically, these tails are long hydrocarbon chains; frequently, they are the very same fatty acids that hold the lipid molecules in the bilayer. Scientists can disassemble biological membranes in the laboratory, separate the component molecules from one another, and then recombine them. With any luck, the molecules will reassemble into a membrane that is reminiscent of the original and, to some degree, functional. This self-assembly demonstrates that membrane molecules carry information about their intended destination within their structures. Membrane lipids and proteins can, in principal, diffuse freely by random (Brownian) motion, circumnavigating a cell within a few minutes. But some membranes have mechanisms to suppress this kind of freedom so as to segregate specified molecules into different domains, or regions of the membrane surface. For example, the epithelial cells that line the intestine, separating the inside from the outside of the body, are polarized to perform distinctly different tasks at their two surfaces. To help maintain their twofaced existence, each cell surface has a belt of protein filaments around its waist called a tight junction that fences off the other membrane molecules into their proper compartments.